On your path to supremacy you will almost inevitably have to engage in military conflict. The following chapter gets you started on the basics of combat and how it is resolved. You issue an attack command to an enemy province capital or army (either via point-and-click or drag-and-drop). Your armies are attacked the same way and defend themselves. Your army crosses path with a hostile army, or when passing the main city in a hostile province. If your army wins the fight, the remaining troops will continue executing the previously given command. Note: Artillery also has an auto-bombardment feature: Idle long-range weapons will start firing at the closest enemy. It is often better to have units select their own target instead of giving an explicit attack order. Combat is resolved turn-based with one attack action per hour (also known as a 'combat tick'). You can check the remaining time before the next combat tick by hovering the mouse over the attacking unit. Both units/armies attack at the same time using their respective attack or defense stats (attack damage takes precedence). These values are influenced by (1) terrain, (2) unit morale, and (3) target unit type, (4) army stack size, and (5) mobilization. Terrain: Unit strength differs between terrain types (land, sea, air). For example, air unit strength is reduced to 10% on land, infantry strength is reduced to 17% on sea, and so on. Morale: Infantry strength is affected by their current morale. At maximum morale they deal their full damage which decreases in a linear fashion with sinking morale (up until 55% morale - after that, damage is not reduced further). Target unit type: The inflicted damage varies between target unit types (normal, air, buildings) and wether the unit in question deals the damage as attack or defense damage. Army stack size: When an army reaches a certain size each additional unit of the same type added to the stack only adds a fraction of its damage to the total damage of the army. Mobilisation: The strength (and thereby damage output) of your army scales with its mobilization in a linear fashion. When stacks of units attack each other, the added damage of one army affects only one unit of the other army. Thus, units will fall one by one. The excess damage per combat tick is applied to the next unit in line. 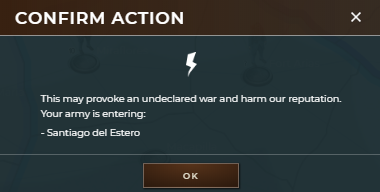 When you issue an attack command on a player with whom you are currently not at war, a pop-up will notify you that this will change your diplomatic relation to that player (see chapter 7 "Diplomacy"). Diplomatic relations are directly affecting the behavior of your troops, causing them to peacefully pass other armies or attacking them when encoutering them on the map. E.g., when you are at war with a player, your troops will always attack their troops. Also, if your troops are encountered on another player's territory, that player's army will take you for an intruder and attack. This happens if your diplomatic relationship is either war, trade embargo, or peace. Setting your relation to right of way, shared map, or shared intelligence will prevent defensive actions by the other players' army. Note: "Peace" just means that your armies won’t automatically start an attack when in range of other armies. Range: Even infantry units have a range. Thus it can happen that your army starts fighting before it reaches its target. In this case the fight will be finished before the army commences its way to the target. Contested targets: In some cases more than one country starts an attack on a single enemy province. Should an ally of yours win the province before you do, your units will continue attacking the city and will cause a war between you and your ally. In order to avoid this, you should not attack the city itself in your initial attack order, but the troops stationed in the city. You can do that by selecting the army in the city as a target or, if the army units aren't visible, the flag that marks the city. Attacking damage / defending damage: An army that is stationary inside a city only does defending damage while the attacking army only does attacking damage. If the army in the city gets a move/attack command or if the battle is taking place outside of a city, both armies attack eachother with attacking damage and retaliate with defending damage (thus those battles are decided twice as fast). Some units have better attacking or defending damage and should be used accordingly.